Kick a@!#$ kosha manghso....even if I say so! It's been a while since I have posted a recipe. That's primarily because I have handed over our kitchen to our maid, Banu. So my role in the kitchen is largely limited to giving her instructions. I do venture into the kitchen occasionally on weekends or to rescue her attempts at times. Recently a couple of our Muslim neighbours gave us some mutton from the goats they sacrificed during Eid or Qurbani. This is the closest I have come to a farmer's life as the goats were tied to our window at the backyard of our apartment for about two weeks. We had not cooked mutton for a while in deference to my cholesterol scores. So I decided to make kosha mangsho, a favourite dish of Kainaz and me. 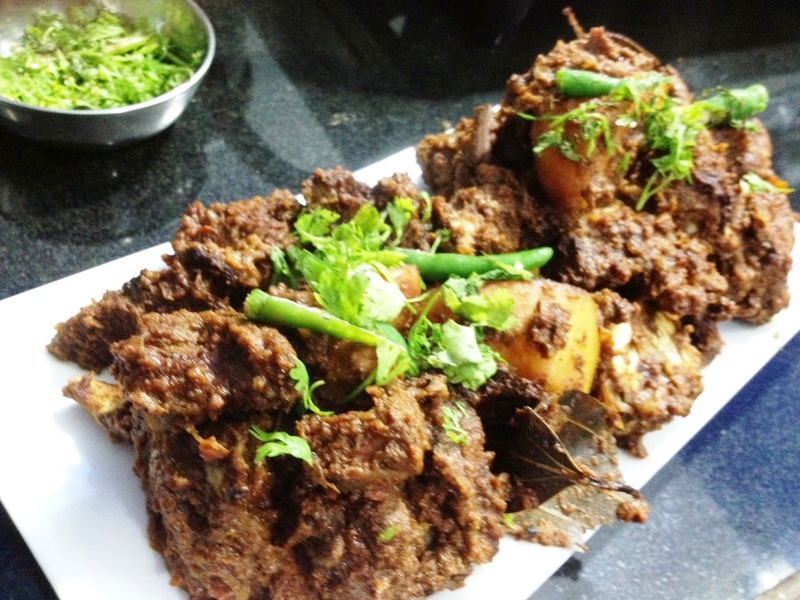 Kosha mangsho is a quintessentially Bengali dish which means mutton which has been kosha'd (kosha means saute'd, bhuno'd) in a thick onion and spice paste. This is my own recipe but the end result is fairly authentic. Marinade the mutton in the mutton paste and keep it in the fridge for as long as possible. Even half an hour would help. The longer the better. Saute the whole garam masala, green chillies and bay leaf in the heated ghee/ oil on a heated pan. There are very few fragrances as heady as that of whole garam masala fried in ghee. Would be a sure man grabber if Chanel was to bottle it as a perfume for women. Once the spices crackle, add the onion paste. Keep stirring till it becomes brown and begins to stick to the vessel. This is VERY important and is key to a good kosha mangsho. If there are no fragrances that match that of crackling garam masala then there are few sights which are as seductive as that of roasted onions where the skin becomes brown and translucent. Add the ginger and garlic (2:1) pastes and stir the mixture till it begins to darken and stiffen. Add the tomato pulp to the base and let the base cook till it looks dusky and heady. The colour should be as deep as possible - sort of brownish. Add in the mutton and potato marinade and salt now and stir the mixture together for about 5 minutes. Add half a cup of water, shut the pressure cooker and put the stove on high flame. Wait for about 4,5 whistles, put the cooker on simmer and let it cook for another 15 - 20 minutes. The paste should be dry when you open the cooker. If not just cook it on the open flame till it becomes dry. This is best had with luchis. paratha, rotis or pulao rice. The cooking time is about 40 minutes from start to finish. A perfume of that fragrance would probably turn men in man(woman)-eaters. Kosha mangsho is such an all time favorite. I like your recipe and yaa seriously we all need to control that oil intake. My mom usually goes into a fit when she sees me cook 1 kg of non-veg in 2 tbsp of oil. Guru fata fati! Abar khabo, roj khabo! Trying to entice the Non-Bong world into my world of Bengali fusion food - care to join me or spread the word around?